So, for the non-geeks, we’re talking about the tiniest microscopic chip ever — “a 5-nanometer device is just a few atoms thick.” What’s more, this development has made it possible for IBM to jam more than 30 billion transistors onto a single piece of silicon the size of your fingernail. If you’re unfamiliar with the inner workings of electronic circuitry, transistors are essentially on-of switches. Developers went on to explain in excruciating detail the methodology used to create IBM’s 5nm chips, and how significantly it differs from the current 10nm processes. If you really want to know, head over to IBM’s announcement post on the company’s THINK Blog. Unfortunately, it’s a bit too comprehensive for me and my eyes started to glaze over as I read about nodes and FinFET transistors and silicon nanosheets. 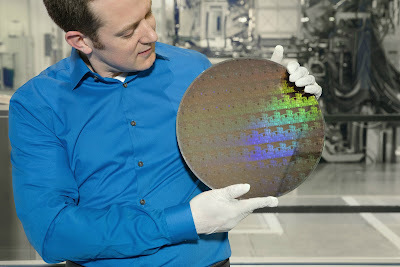 What I was able to take away from IBM’s announcement post is that its 5nm chips are expected to be available within the next three-to-five years. What’s the Big Deal With a 5nm Chip? The development of the 5nm chip is monumental for the future of technology, as it opens the door for even more advanced applications that would not have been possible otherwise using today’s leading 10nm silicon. Essentially, the processes used to develop those 10nm chips has reached its maximum capacity. With a legitimate working 5nm chip, IBM has just positioned itself at the front of the pack. Competitors such as Samsung Electronic (OTCMKTS:SSNLF) and Intel Corporation (NASDAQ:INTC) currently produce only 10nm chips holding approximately 10-15 million transistors. The new IBM chip is half the size and contains more than twice as many transistors. For specific segments of the technology industry such as artificial intelligence, virtual reality, machine deep learning and autonomous vehicles, the ability to incorporate chips that consume 75% less power while performing 40% better will be extremely advantageous and serve to further increase the speed of developments in those fields. Simply put, these new IBM chips should open the door to countless advancements in an array of major tech fields. Despite management’s announcement of what is truly a revolutionary leap forward in the design and manufacture of semiconductors, Wall Street hasn’t reacted, at least not yet. IBM stock has remained essentially flat, even as geeks across the world picked their jaws up off the floor and tech bloggers have flooded news feeds with excited commentary and speculation. But just because IBM stock didn’t spike after the announcement does not mean that the company’s 5nm chip won’t benefit investors. Quite the contrary, actually. The chip not only demonstrates IBM’s leading position in the semiconductor industry, it also ensures that IBM will remain the dominant force for years to come. It’s true that IBM isn’t typically the first company that comes to mind when the average investor thinks of microchips and semiconductors; instead, it has traditionally been Intel, both because of the company’s own advancements in silicon development technology and because of extremely successful marketing techniques back in the 1990s. While IBM has always remained a tech industry powerhouse, much of the company’s focus shifted away from consumer-oriented retail sales to business and enterprise-oriented sales. Look at it this way — IBM was (and still is) akin to a sleeping giant, one that may now be waking up. This isn’t to suggest that management will shift focus back to consumer retail sales, though. Rather, IBM has simply been biding time while management made good on its 2014 promise to spend upwards of $3 billion on silicon R&D. In fact, the specific technology (namely nanosheets) that allowed IBM to successfully develop its 5nm chips has been described by some as “new technology” or “a new direction,” yet the company has actually been working with nanosheets for more than a decade. While the rest of the industry poured time, effort and money into refining FinFET methodology, IBM engineers had already realized the potential that could be unlocked with the alternative design of nanosheets. So, the long-term outlook here is that IBM stock should definitely increase in value, particularly in a few years when its 5nm chips hit the street. Plus, IBM pays a healthy 3.94% dividend yield, or $6 per share, and the company has increased dividend payouts every year for the past 20 consecutive years. If you’re looking for a solid long-term blue chip, look no further than IBM stock.